Long before every possible item of clothing was embellished with holiday motifs, there were simple things such as costume jewelry and delicate hankies. I can still clearly recall the Christmas tree pin on the left gracing the lapel of Grandmother Bessie's heavy wool winter coat. The pin on the right belonged to my mother. 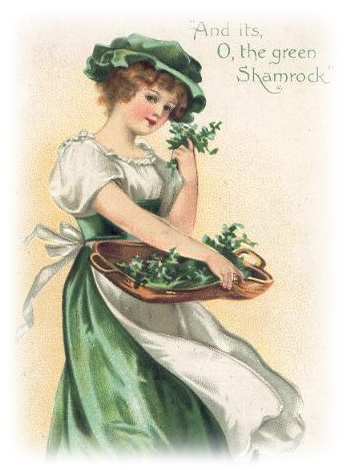 It was more likely to adorn a suit or dress worn to church during Advent, or to a holiday party or gathering. The hankie was given to me by Mother. 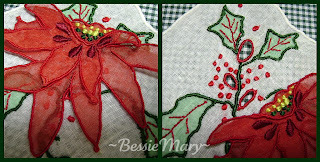 She always found the perfect hankie for every holiday and occasion! This larger embroidering of holly leaves and berries appears in one corner, with smaller motifs of leaves and berries on each of the remaining three corners. 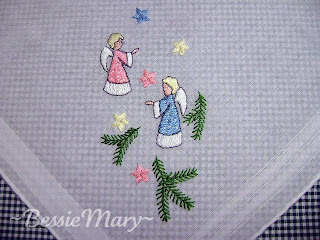 The edges are finished with a pin-stitched or point de paris maderia hem. 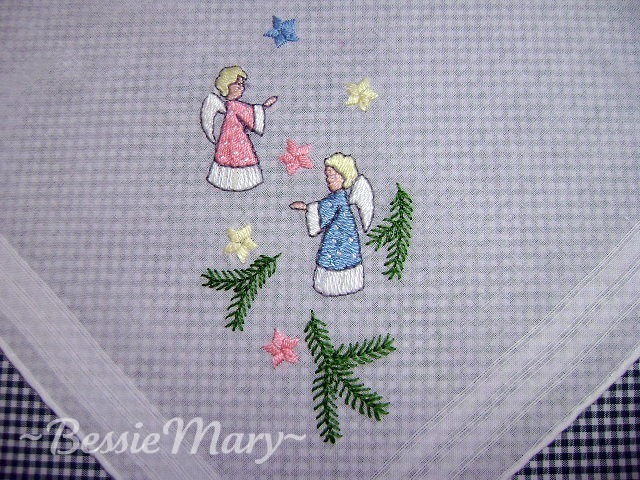 Another Christmas hankie received as a gift from Mother. It was one of the last hankies she gave me. It would be so sweet incorporated into a collar on a little girl's holiday dress, if only I was brave enough to take a pair of scissors to it! I discovered this unique poinsettia hankie in a local antique store, and immediately fell in love! The leaves, which seem to resemble holly leaves more than poinsettia leaves, are cut from green organza and appliqued onto the hankie. 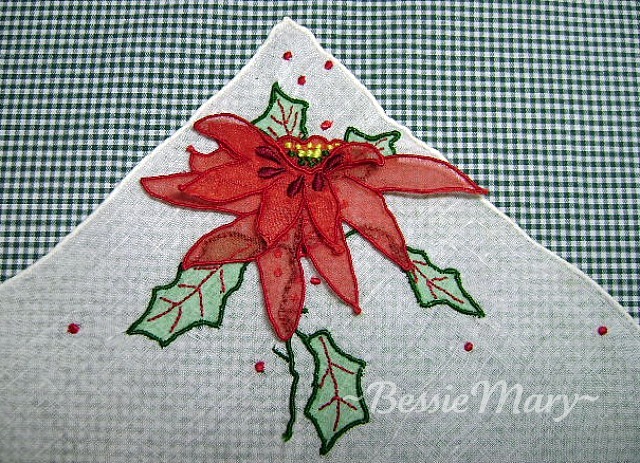 The poinsettia is also organza, tightly satin stitched around the edges, and embellished with additional padded satin stitch and granitos. It all appears to be done by hand. There is a tiny button sewn to the wrong side of the bloom, allowing it to be buttoned through one of the three elongated eyelets. 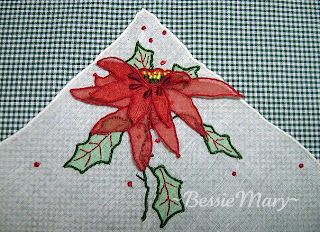 The remaining three corners of the hankie have smaller appliqued holly leaves and granito berries. It is lovely with, or without, the poinsettia attached. 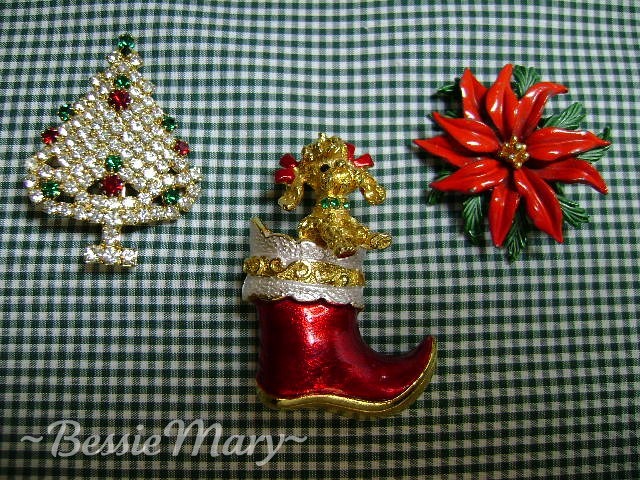 These are three holiday themed pins that have long been in my jewelry drawer. The poodle in the stocking was received as a young girl. Our family dog was a chocolate poodle, and I loved all things poodle! The poinsettia pin shows the most signs of wear. In my former career as a legal assistant at large downtown Houston and Dallas firms, my wardrobe was restricted to very conservative suits or sweater sets and skirts. This small pin was my way of acknowledging the holidays and spreading a little joy and cheer. I hope you are finding time to enjoy simple pleasures during these busy last days before Christmas! 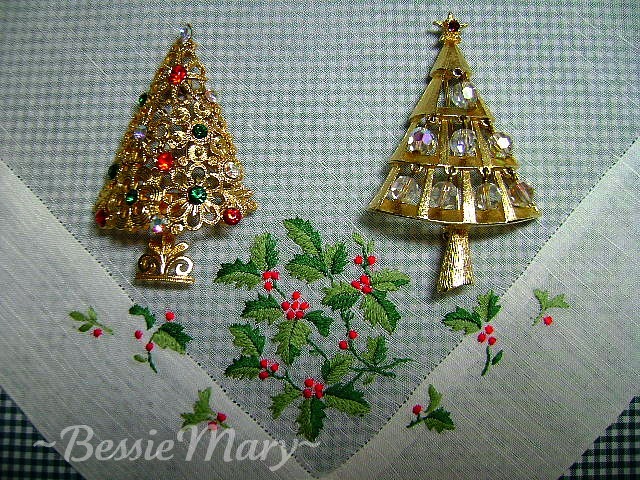 I also have Christmas pins and special hankies that I love. Another thing I see that we have in common is former careers in the legal field. I never lived anywhere as metropolitan as Houston or Dallas, but I ran a law firm for two attorneys, and was their paralegal for 8 years in Wisconsin. I'm healing well, but still swollen. How are you doing, my friend? I'm so happy that things went well. I think St. Lucy had a busy day, watching over us. I prayed she'd give you LOTS of her grace. I also have the rhinestone Christmas tree that was mom's. I was just thinking on what outfit or coat I can put it on to wear for our Christmas Eve celebration with Seth's family this week. :) Beautiful heirlooms, Aunt Jan. Thanks for sharing! I love these hankies. There was an antique store in Williamsburg and I was always digging thru all their treasured hankies and have quite a few of them. I bought them thinking collars for dresses for Sydney, but I just can't bear the thought of cutting them. Those Christmas pins are so sweet. I think I may need one for myself. I love the idea of dressing up anything with them. 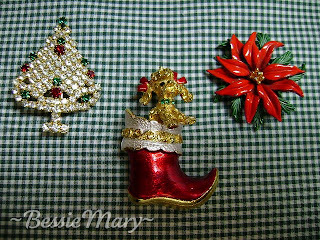 My mother had a lot of Christmas pins. She had Easter, Halloween, etcc....... as well. My sister and I just went through all of her jewelry. There was nothing of $$$ value, but lots of memories were brought to light! Such sweet memories you have, Jan & evoke the same among many of us. I've got a box of similar hankies, too, just waiting for the right project. I'll probably NEVER cut into them. I was so encouraged to read that your surgery went well & that you are recovering with some glimmer (pun intended) of hope towards improvement. My sister & her prayer warriors are following your progress, too. Have a wonderfully joyous Christmas!